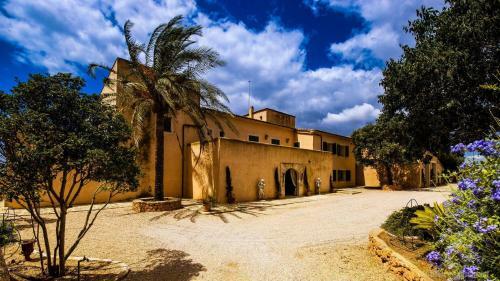 Agroturismo Finca Es Llobets - Adults Only in Llucmajor is a small-scale hotel with 10 Rooms. Offering an outdoor pool, Agroturismo Fincahotel Es Llobets - Adults Only is located in El Estanyol. There is free WiFi available throughout. Each room comes with a TV and a seating area with a satellite TV. The bathroom has a shower and a hairdryer. All rooms offer garden views. Other facilities offered at the property include a shared lounge and a games room. An array of activities can be enjoyed on site or in the surroundings, including cycling and hiking. The property offers free parking. Pa...lma de Mallorca Airport is 22 km away. Offering an outdoor pool, Agroturismo Fincahotel Es Llobets - Adults Only is located in El Estanyol. There is free WiFi available throughout. Each roo...m comes with a TV and a seating area with a satellite TV. The bathroom has a shower and a hairdryer. All rooms offer garden views. Other facilities offered at the property include a shared lounge and a games room. An array of activities can be enjoyed on site or in the surroundings, including cycling and hiking. The property offers free parking. Palma de Mallorca Airport is 22 km away. When would you like to stay at Agroturismo Fincahotel Es Llobets - Adults Only? Please inform Agroturismo Fincahotel Es Llobets - Adults Only in advance of your expected arrival time. You can use the Special Requests box when booking, or contact the property directly with the contact details provided in your confirmation.